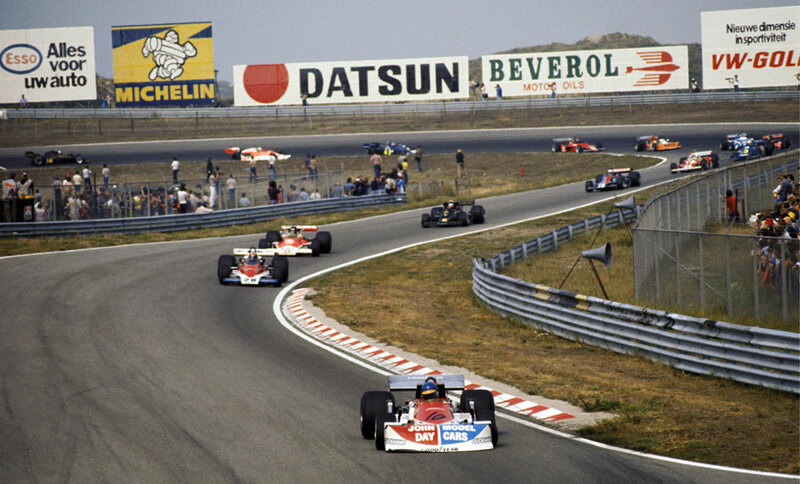 James Hunt celebrated his 29th birthday with victory at the Dutch Grand Prix at Zandvoort, and in so doing closed the gap on Niki Lauda in the drivers' championship to three points with four races remaining. Enzo Ferrari, who had withdrawn his team from the championship in a fit of pique, had a change of heart and so it was back, albeit with only one car. News in the days before the race that Lauda was aiming for a remarkable return in Canada in early October also ruffled a calm McLaren camp who had seemed to have things under control in the absence of its chief rivals for both titles. Qualifying threw up some unexpected placings. Hunt, persevering in his trusted M23 while allowing Jochen Mass to race-test McLaren's new M26, was second behind Ronnie Peterson. Tom Pryce, in a new Shadow DN8, was third with John Watson in fourth and the returning Ferrari of Clay Regazzoni back in fifth. Peterson made comfortably the best start and led for 11 laps, mainly from Watson who harried him at every turn, more than once running side-by-side with the March. But on the eighth lap Watson spun, allowing Hunt to pass, and three laps later Hunt also overtook Peterson who slowly dropped back through the field. Watson then began pressurising Hunt, and for almost 30 laps his Penske was never more than a few seconds behind and more than once it seemed he would be able to get through. But the ding-dong battle ended on the 47th lap when Watson lost fourth and fifth gears and retired. Hunt was by now having troubles of his own as a result of a detached brake duct, and Regazzoni closed to within a second of him. But Hunt's luck was in as on the penultimate lap he lapped Alan Jones' Durex-sponsored Surtees without trouble but Regazzoni was briefly held up. Hunt came home a second ahead of the Ferrari with Mario Andretti another two seconds back in third. Pryce was an impressive fourth. Jacky Ickx seemed set for fifth when his Ensign suffered electrical failure. He had impressed critics by taking the drive for free in a bid to kick-start a career which had hit the buffers when he moved to Lotus just as the team hit a poor period. He consistently lapped faster than Hunt in the second half of the race and received a huge reception when he trudged back into the pits.